VATICAN CITY (CNS) — Like the Catholic Church’s newest saints, Christians are called to live their faith as a love story with God who wants a relationship that is “more than that of devoted subjects with their king,” Pope Francis said. 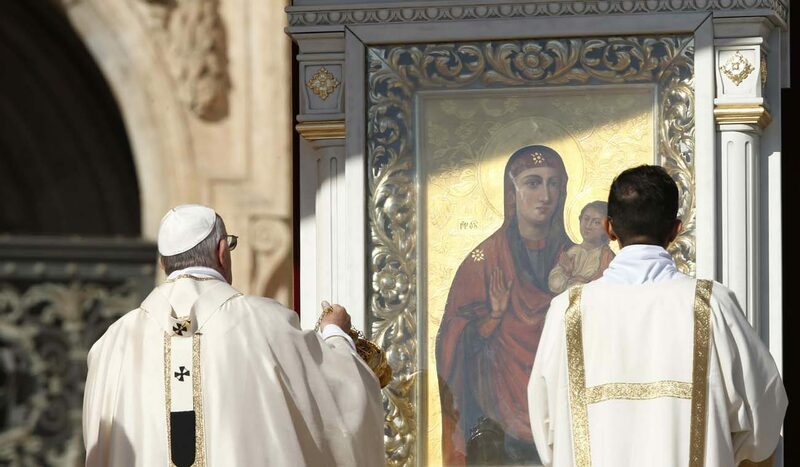 Without a loving relationship with God, Christian life can become empty and “an impossible ethic, a collection of rules and laws to obey for no good reason,” the pope said during Mass Oct. 15 in St. Peter’s Square. “This is the danger: a Christian life that becomes routine, content with ‘normality,’ without drive or enthusiasm, and with a short memory,” he said during the Mass. At the beginning of the Mass, Pope Francis proclaimed 35 new saints, including: the “Martyrs of Natal,” Brazil, a group of 30 priests, laymen, women and children who were killed in 1645 during a wave of anti-Catholic persecution; and the “Child Martyrs of Tlaxcala,” three children who were among Mexico’s first native converts and were killed for refusing to renounce the faith. Tapestries hung from the facade of St. Peter’s Basilica bearing images of the martyrs as well as pictures of Sts. Angelo da Acri, an Italian Capuchin priest known for his defense of the poor, and Faustino Miguez, a Spanish priest who started an advanced school for girls at a time when such education was limited almost exclusively to boys. An estimated 35,000 pilgrims — many of them from the new saints’ countries of origin — attended the Mass, the Vatican said Oct. 15. In his homily, Pope Francis reflected on the day’s Gospel reading from St. Matthew in which Jesus recounts the parable of the wedding feast. Noting Jesus’ emphasis on the wedding guests, the pope said that God “wants us, he goes out to seek us and he invites us” to celebrate with him. However, he continued, Jesus also warns that “the invitation can be refused” as it was by those who “made light” of the invitation or were too caught up in their own affairs to consider attending the banquet. “This is how love grows cold, not out of malice but out of preference for what is our own: our security, our self-affirmation, our comfort,” the pope said. Despite constant rejection and indifference, God does not cancel the wedding feast but continues to invite Christians to overcome “the whims of our peevish and lazy selves” and to imitate the church’s new saints who, he said, not only said yes to God’s invitation, but wore “the wedding garment” of God’s love.